Background: Bile salts possess unique chemical structural characteristics and are very different from conventional surfactants. Due to the fascinating physiological functions, the bile salts have been widely studied by various physical methods. Last three decades are the witness about rapid studies on bile salts aggregation with surfactant but yet uncertain related to mixed micellar system. Objective: The primary objective of this study was to undertake systematic studies on the mixed systems comprising of cationic surfactant CPyCl + bile salts in water and NaCl solution by surface tension and viscosity method. Methods: Drop weight method (surface tension method) and viscometry methods are chosen to discuss the interaction between bile salts and surfactant mixed system. Results: Systematic studies on CPyCl + bile salts were carried out using Rubingh’s regular solution theory in presence/absence of NaCl. The CMC and viscosity data measurements were recorded. Molecular interaction parameters β was calculated to determine the depth of synergism between the micellar systems. Conclusions: Synergisms occur when cationic surfactant CPyCl and bile salts such as NaDC/NaC were mixed. 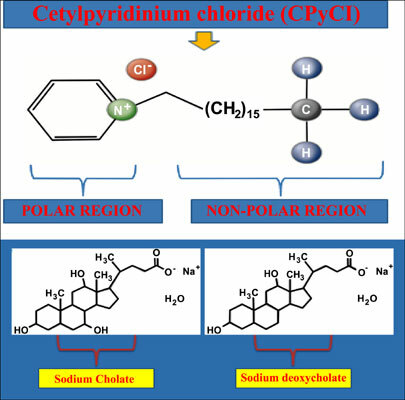 NaCl has the ability to modify the structure of CPyCl and bile salts. Micelle size grows with increase in NaCl concentration. CMC of CPyCl decreases as the concentration of salts increases. Viscosity data reveals that size of CPyCl micelle increases with increasing NaCl concentration. Bile salt, micellization, surfactant, CMC, hydrographic, aliphatic.